The city of Stockholm is clean and modern, but with a rich history that is clear in its classic features. 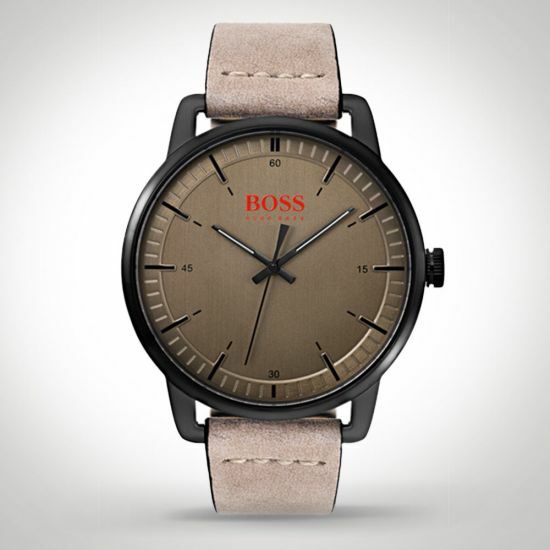 So, it is no wonder that Boss chose this city to give its name to a watch with the same traits, the Hugo Boss Orange Stockholm 1550073 watch. Like the city of Stockholm, this watch’s roots are planted in classic style. But, over the top of that you have distinctly modern features. These start with the soft and stylish strap in a light grey/brown shade. This connects to a bold yet sophisticated case in black, carbon-coated steel. This surrounds a brilliant dial in a very interesting tarnished brass tone. The city of Stockholm is known for its efficiency, and this watch is right there with it. Keeping the Boss Stockholm always precise is its Reliable Quartz movement, which stays as up-to-the-minute as its looks. If you want a watch that, like Stockholm, is full of classic charm but contemporary coolness, you want the Hugo Boss Orange Stockholm!